St. Johannes Lutheran Church is located in historic Ansonborough, on the corner of Anson and Hasell Streets, between East Bay Street and Meeting Street, just one block north of Market Street in the heart of Charleston’s tourist district. Cross the Ashley River Bridge onto the peninsula of Charleston; stay in the right lane coming off of the bridge onto Lockwood Boulevard. Lockwood will turn to the left and become Broad Street. Continue on Broad through several lights to the intersection of Broad and Meeting Streets. Turn left onto Meeting and continue several blocks to the intersection of Meeting and Hasell Streets. Take a right on Hasell. The church is one block on the left, with parking available in the small lot across from the church and on the street. Cross the Ravenel Bridge and take the East Bay Street exit. Turn left on East Bay Street. Continue on East Bay Street past Calhoun Street to Hasell Street. Turn right on Hasell Street. The church is one block on the right, with parking available in the small lot across from the church and on the street. Continue to the end of I-26 and follow the signs to Meeting Street. Turn right at the light at the bottom of the exit ramp on to Meeting Street. Continue past the intersection at Calhoun Street for about four blocks. Turn left onto Hasell Street. The church is one block on the left, with parking available in the small lot across from the church on on the street. 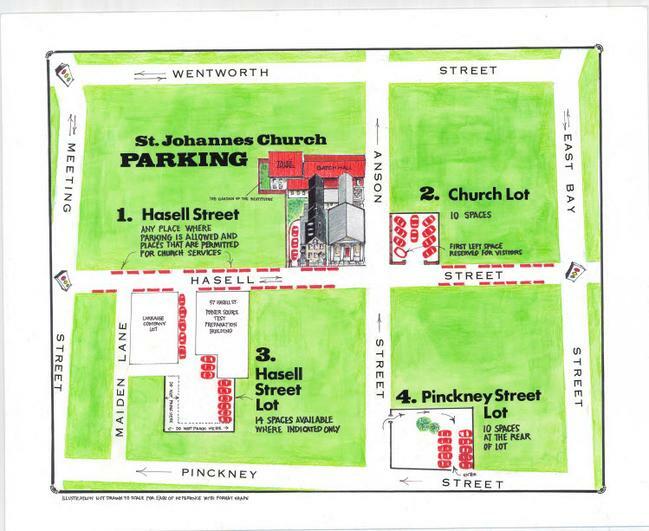 St. Johannes has 3 separate parking lots available for worship parking on Sundays. In addition to the parking lots, there is also off-street parking along Hasell Street available for church parking during church services. You’ll find their locations and descriptions and a detailed parking map below.